The movie was released during the holiday season in 1985. Right at the cusp of my interest in murder mysteries. Though I’d always loved the board game, I never did get to see it at the cinema. By the time I saw it on TV, they had strung all three endings together. One of the three endings was randomly shown in movie theaters. The cast is phenomenal! Tim Curry as Wadsworth, a master of ceremonies as it were; Martin Mull as Col. Mustard; Lesley Ann Warren as Miss Scarlet; the late, great Madeline Kahn as Mrs. White, who was not the maid; Eileen Brennan as Mrs. Peacock; Christopher Lloyd as Prof. Plum; Michael McKean as Mr. Green; and Colleen Camp as Yvette, the maid. So many familiar faces. I’d seen many of them in prior performances. I couldn’t imagine a better cast. This movie is an awesome comedy. Rapid-fire one liners, slapstick, tongue-in-cheek, and even self parody! Set in 1950s McCarthy era, six guests are invited to a mysterious manor. They meet the butler and assume a pseudonym. None of them appear to known each other or where their mysterious host is. Their host, Mr. Boddy, arrives and we learn they are all being blackmailed. Mr. Boddy hands out presents to each guest and voila, the familiar weapons…candlestick, rope, wrench, lead pipe, revolver and knife. What ensues is a Clue game played out on the screen. Without giving away any of the endings (a major faux pas), I will say that having seen the movie countless times only one ending truly works. The film edits during the blackout scene make it impossible for two “killers” to off their intended victims. You just can’t be in two places at once! That being said, only the first ending is possible. At least, I haven’t been able to find any holes in it like the other two. Though the film is mostly played for laughs, the mystery component is actually rather good, especially when you consider that they tried to make it possible for multiple endings. I sometimes try and see if I can come up with other possible endings that might fit. I do believe there is one, which they didn’t use, that would have worked. Over the years, looking up tidbits about the game and movie, I’ve come across sites that talk about a mysterious fourth ending that had been planned, but scraped. Apparently, it appeared in book adaptations of the movie. Just do a Google search for “clue fourth ending” to find it. It’s even more unlikely than the ones they did film! It’s true, Clue is not perfect. There are a number of goofs and continuity errors, just check out the film’s imdb listing! But in a way, this makes it all the more endearing. 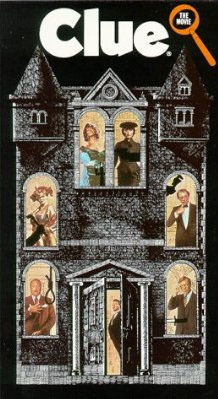 Clue was the first VHS movie I ever bought. Needless to say, the VHS got rather worn out. I’ve since replaced it on DVD. What’s great about the DVD release is that it allows you the option to chose an ending or have one play randomly. With a vast film collection, Clue is one of the few films I watch on a fairly regular basis as it always delights. It’s a must-see for any mystery fan.